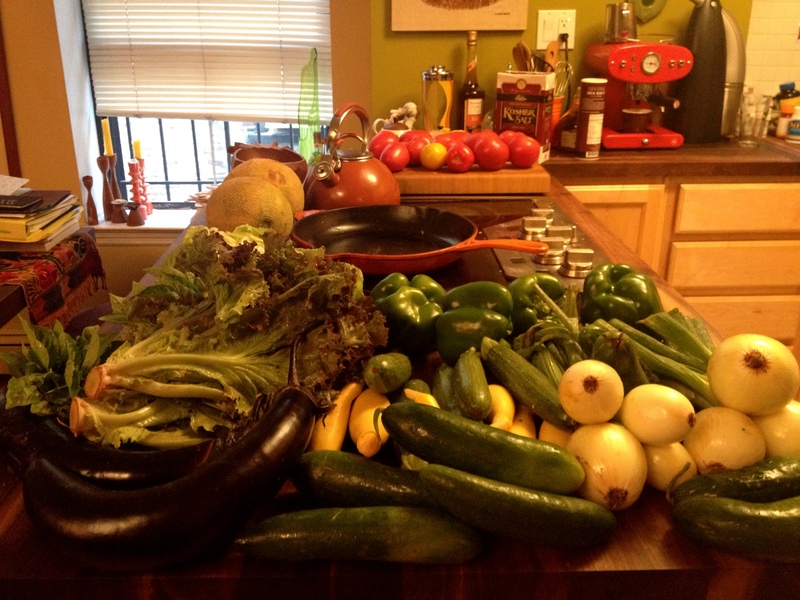 My friend Sara is on vacation in Maine this week, which means that I picked up a double CSA share Tuesday night. Hauling this quantity of vegetables plus two melons, goat yogurt, honey, eggs, granola, and a few pounds of assorted meat is no joke. It took me a good 30 minutes just to organize my refrigerator. Between the tomatoes, onions, green pepper, cucumbers and fresh basil, it was clear what had to be done. Add the tomatoes to the large bowl of a food processor and run until you have a slightly chunky tomato sauce. Add the rest of the vegetables, oil and vinegar and a good dose of salt and pepper. Run until any large chunks are gone. Taste and adjust seasoning with additional vinegar, salt and/or pepper. You can also add a pinch of sugar or a few dashes of hot sauce to balance the flavors. Add the herbs and run for about a minute more. Refrigerate for at least a few hours to allow flavors to meld. Combine all ingredients and let sit in refrigerator for at least an hour. Bring a large cast iron skillet up to medium-low heat and swirl with the olive oil. Place bread in skillet and let sit until the bottom side is crisp and just a bit browned. Flip and repeat. Return the skillet to the stove over medium heat. Toss the calamari with oil, Aleppo pepper, garlic, salt and pepper. 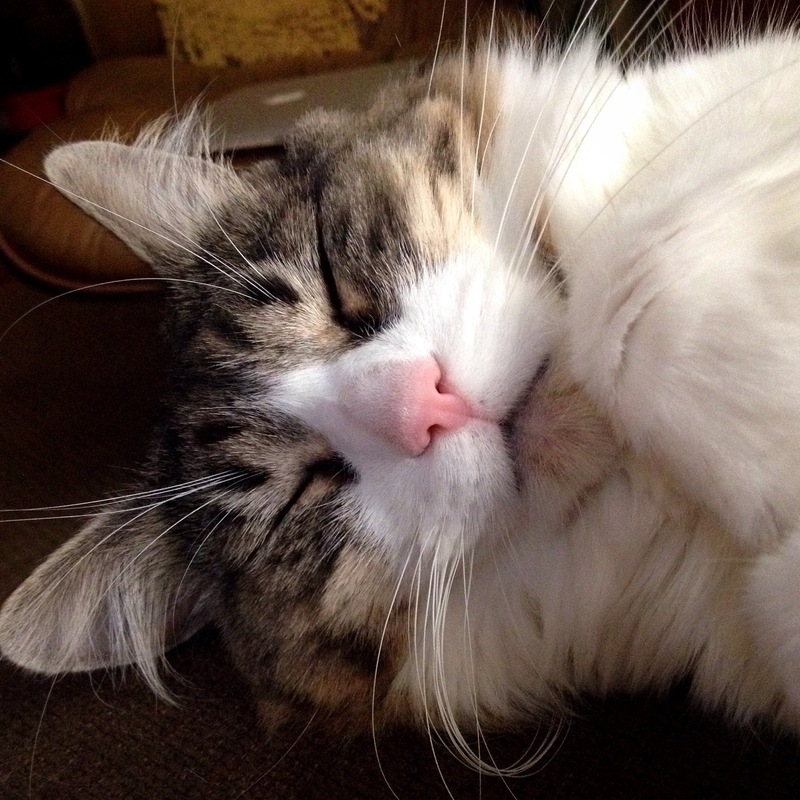 Add to skillet, cook for one minute, stir and flip pieces and cook for one more minute. Remove from heat and dress with lemon. At this point, you are ready to plate. 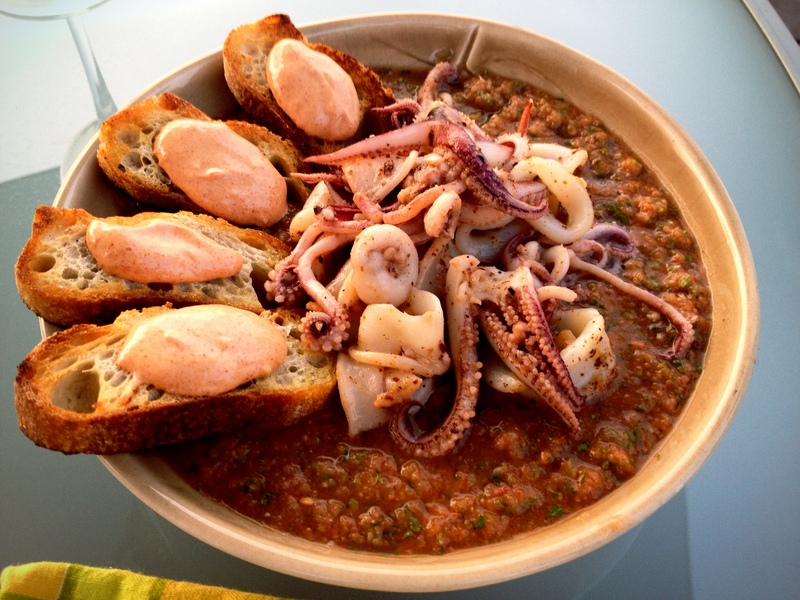 Pour the gazpacho into bowls and nestle the calamari in the center of each. Spread the aioli onto your crostini and strategically place alongside the calamari. Sean and I ate our supper on the roof while sipping a crisp Sauvignon Blanc and admiring the pink and orange sunset–which, now that I think about it, evoked the warm hues of our gazpacho with calamari a la plancha and paprika-aioli crostini. 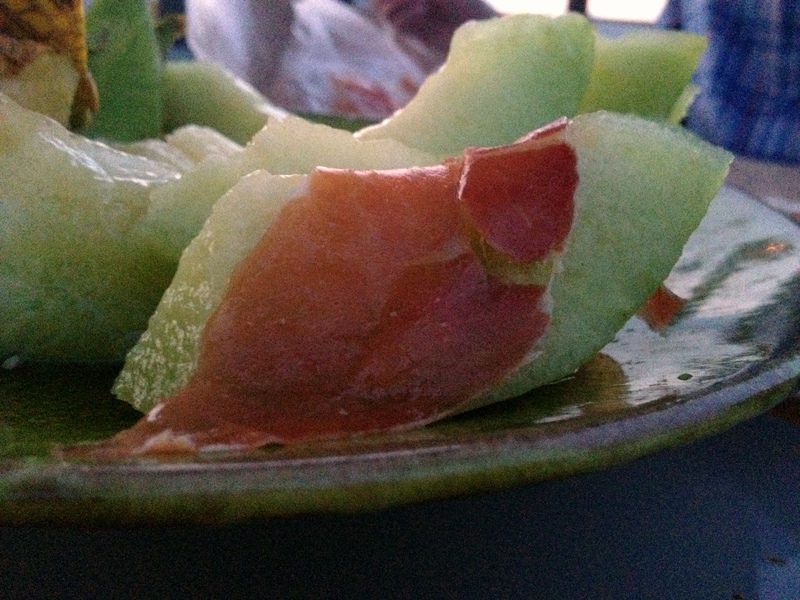 For dessert, we managed to polish off a whole, perfectly ripe melon with some lovely serrano ham I’d picked up earlier in the day at BKLYN Larder. A couple of hours later we trekked down four flights of stairs, walked past a handful of buildings, climbed another four flights and joined friends on a nearby rooftop for one last round of drinks before calling it a night. God, I love summer. This entry was posted in main courses, seafood, soups & stews and tagged bread, cucumber, fennel, green pepper, squid, tomatoes by Jasmine Nielsen. Bookmark the permalink.